Are the interaction levels on your Facebook Page dismally low? 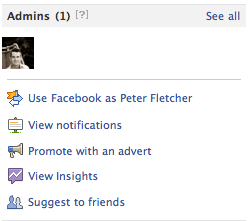 If so a new feature available only to Facebook Page admins will help you turn things around. Facebook have just rolled out a new facility that allows Page admins to access their Page notifications using their personal profile. Previously notifications were only available when using Facebook as a page. And that extra step meant that pages weren’t being monitored and Page fans were being left disappointed. Notifications are now available from the View Notifications link in the right sidebar of the Page you administer. These notifications show the interactions on your page and include a link to the relevant story. Admins can dramatically improve the experience of their fans by responding to fan posts and comments quickly. Doing so improves page interaction levels significantly and increases the likelihood of a story appearing in the all-important Top News tab. If you found this story helpful please click the Facebook Like button below or leave a comment.